Full of potent antioxidants, herbal teas bring great health benefits and help treat minor conditions as well as better manage more serious ones, provided they are consumed mindfully. More recent research has shown that herbal teas, also referred to as herbal infusions or simply teas, have an incredibly positive effect on our health as a result of their high antioxidant content. Depending on your current state of health as well as choice of tea, you can enjoy a lot of health benefits related to regular consumption. Benefits may range from increased energy levels, faster metabolism and improved digestive health to headache, muscle pain, muscle tension and allergy relief. Herbal teas can even help improve more serious medical conditions such as hypertension as well as diabetes. 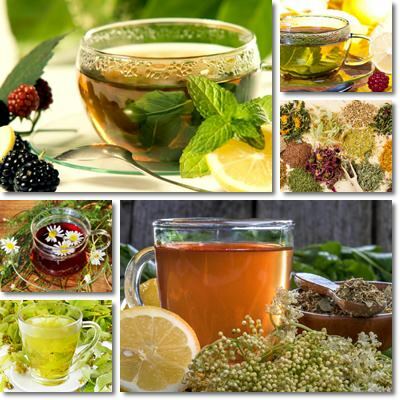 Recommended dosage usually varies between 1-3 cups a day, depending on the type of herbal tea. Nevertheless, it might be best to talk to your doctor first, especially if your are already receiving medical treatment to see how a certain herb may interact with your current medication or alter your condition. 1) Chamomile. Herbal teas made with chamomile are calming, soothing and exert a rather powerful anti-inflammatory action. They are great for nervousness, PMS cramps and digestion related cramps, flatulence and colds. Chamomile is one of the most popular tea herbs, drank throughout the world. However, it is also a potential allergen (it is related to daisies) and can cause mild to severe allergic reactions. So if you suspect you may have an allergy to chamomile and have never consumed the tea, it is best to have an allergy test before anything. 2) Chrysanthemum. While it may sound as an uncommon choice for a herbal infusion, chrysanthemum tea is said to help lower high blood pressure, relieve headaches and help with tinnitus and skin problems such as acne. In addition to this, infusing chrysanthemum flowers appear to help with colds and flu by reducing fever and sore throat pain and increases alertness and focus. 3) Citronella. Drinking citronella tea is said to encourage a reduction in blood pressure, improve blood circulation, stimulate immunity and detoxify our internal organs. Moreover, regular consumption is believed to reduce flatulence, cellulite and improve skin appearance as well as muscle tone. Citronella essential oil, present in a variety of tea blends, boasts a relaxing effect on the nervous system. 4) Dandelion. Surprisingly, this highly underrated plant is a great natural diuretic and liver purifying agent with a strong hepatoprotective action. It is great for improving bile function and bile secretion, aids digestion, increases appetite and calms indigestion. Because they promote the elimination of toxins and support the growth of good bacteria, dandelions contribute to colon health, relieve constipation and help clear skin. 5) Echinacea. Drinking echinacea infusions is recommended for the treatment and management of skin conditions such as eczema, psoriasis, urticaria as well as for any condition brought on by poor immunity. This includes urinary tract infections, colds, flu, sinusitis, hay fever and allergies in general. Moreover, infusions are believed to help with tissue healing and blood cleansing. 6) Fennel. Surprisingly, fennel tea is an excellent natural expectorant, very useful in cold and flu treatment. It stimulates liver activity and bile secretion, helps reduce nausea and bloating and stimulates milk production in nursing mothers. 7) Hibiscus. This plant is a common diuretic, immune booster and great source of antioxidants. Regular consumption of hibiscus-based infusions is said to help reduce hypertension, lower blood cholesterol levels and possess diuretic effects. 8) Kava. Herbal infusions made with kava have been shown to possess strong sedative effects. The plant functions as a sedative, anxiolytic (inhibits anxiety), antispasmodic and muscle relaxant. It is recommended for depression, anxiety, panic attacks, memory problems, muscle pain and cramps, PMS (premenstrual syndrome) and even asthma. 9) Lavender is well-known for its relaxing properties. Lavender tea boasts an antispasmodic action and is thus recommended and used for asthma, bronchitis, urinary tract problems, muscle cramps, anxiety, headaches, indigestion and flatulence. 10) Licorice. My favorite of them all, licorice boasts excellent hepatoprotective properties, reduces inflammation, improves stress resistance and helps protect against tooth decay and gum problems. It is used to calm cough, reduce phelgm production, ulcer and colitis pain, heartburn and even boasts mild laxative properties. 11) Peppermint. As you may already know, peppermint is both an excellent antispasmodic and a wonderful refreshing drink. Tea made from this herb helps combat loose stools and acts as a local antispasmodic and disinfectant. It is also recommended for bad breath problems, indigestion, heartburn, nausea, vomiting and even cough and stress. Its strong, yet pleasant flavor has an energizing effect. 12) Mullein. Herbal infusions from mullein have expectorant, diuretic as well as soothing properties. The herb is said to help with allergies, inflammation, mouth sores, dry cough and respiratory problems, even rash and swollen lymph nodes. 13) Nettle. Infused nettle is a great natural antihistamine, anti-inflammatory, diuretic and astrigent. As a result, it is recommended for a better management of seasonal allergies, for chronic inflammation, arthritis, excessive mucus production, burning sensation and difficulty urinating and skin disorders. 14) Rooibos. Recent studies reveal the fact that rooibos is not only rich in antioxidants, but also possesses antispasmodic and mildly sedative properties. This type of tea is considered to be efficient against irritability, headaches, mild depression episodes as well as nausea, stomach cramps, heartburn and hypertension. For best results, herbal teas should be consumed over long periods of time. You can’t expect great results after one cup, but drinking at least two cups a day for several weeks might surprise you greatly. If you want to address a specific medical condition such as diabetes, hypertension, constipation etc. with more herbal options, feel free to read more on the topic What tea should I drink. Conclusion. However, remember that herbs are not completely harmless: they can interfere with medication, cause miscarriages, allergies and so on. So please refer to a medical professional for advice regarding risks (especially if you are on prescribed medication already), dosage etc. and read up on them yourself.